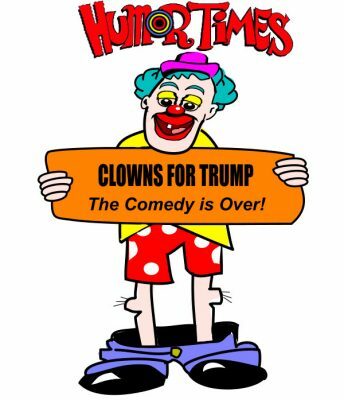 LAS VEGAS — Following Wednesday night’s disastrous debate performance, Donald Trump today blamed the “elitist, Clinton-loving Humor Times” for his defeat. The Fuming Fuhrer brandished his little fist. Trump pulled out a sheet of paper and began waving it over his head. “I have here a list,” he shouted “of no less than 67 or maybe three or 15 dishonest and crooked writers who regularly publish in the Yuma Times, including nasty people like Will Durst, Paul Lander, Gary Chew, Jim Hightower, Diane de Anda, Rick Blum, Ben Krull and Howard Zaharoff! Trump’s fading toupee lifted slightly in the breeze. “And then that Freed or Fried guy also reports about my plans to set up an American gulag. How’d he find out about that, huh? Mr Trump refused to say whether he would be cancelling his long-standing subscription to Humor Times magazine (Editor’s note: available worldwide, in print or digital formats!). “I’m gonna leave you all in suspense,” he said.